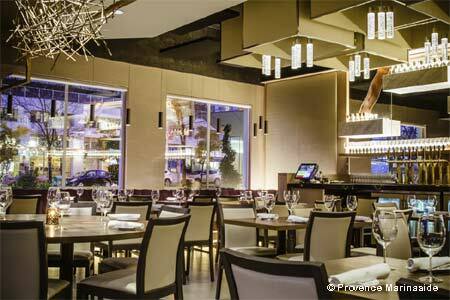 Provençal-inspired fare stars in a seductive waterside Yaletown location. : Husband and wife team chef Jean-Francis, a native of Nice, France, and Canadian-born chef Alessandra Quaglia offer a menu matching traditional favorites from the French Mediterranean with seasonal, local ingredients. Pacific Northwest seafood takes center stage in their sophisticated Yaletown dining room overlooking False Creek and yachts at anchor. Start your meal with a richly flavorful fish soup, a plate of fresh oysters, or warm goat cheese crusted with herbes de Provence on a bed of organic greens. Mains such as a classic bouillabaisse served with a fiery accent of rouille and shards of Gruyère, a whole Dungeness crab Provençal-style, and free-range chicken with frites are French comfort food. Save room for a lemon tart or a warm berry and white chocolate clafoutis. With upwards of 100 wines on tap, there are choices galore and knowledgeable servers will help you pair a BC or international selection, whether a shellfish-friendly white, rosé or fresh and fruity red with each course. Have breakfast or brunch on the expansive patio overlooking the marina, which offers an ideal venue for people-watching.